Election days come and go. But political and social revolutions that attempt to transform our society never end. They continue every day, every week and every month in the fight to create a nation of social and economic justice. That’s what the trade union movement is about. That’s what the civil rights movement is about. That’s what the women’s movement is about. That’s what the gay rights movement is about. That’s what the environmental movement is about. And that’s what this campaign has been about over the past year. That’s what the political revolution is about and that’s why the political revolution must continue into the future. This campaign has never been about any single candidate. It is always about transforming America. It is about ending a campaign finance system which is corrupt and allows billionaires to buy elections. It is about ending the grotesque level of wealth and income inequality that we are experiencing where almost all new wealth and income goes to the people on top, where the 20 wealthiest people own more wealth than the bottom 150 million. It is about creating an economy that works for all of us, not just the 1 percent. It is about ending the disgrace of native Americans who live on the Pine Ridge, South Dakota, reservation having a life expectancy lower than many third-world countries. It is about ending the incredible despair that exists in many parts of this country where – as a result of unemployment and low wages, suicide, drugs and alcohol – millions of Americans are now dying, in an ahistorical way, at a younger age than their parents. It is about ending the disgrace of having the highest level of childhood poverty of almost any major country on earth and having public school systems in inner cities that are totally failing our children – where kids now stand a greater chance of ending up in jail than ending up with a college degree. It is about ending the disgrace that millions of undocumented people in this country continue to live in fear and are exploited every day on their jobs because they have no legal rights. It is about ending the disgrace of tens of thousands of Americans dying every year from preventable deaths because they either lack health insurance, have high deductibles or cannot afford the outrageously high cost of the prescription drugs they need. It is about ending the disgrace of hundreds of thousands of bright young people unable to go to college because their families are poor or working class, while millions more struggle with suffocating levels of student debt. It is about ending the pain of a young single mother in Nevada, in tears, telling me that she doesn’t know how she and her daughter can make it on $10.45 an hour. And the reality that today millions of our fellow Americans are working at starvation wages. It is about ending the disgrace of a mother in Flynt, Michigan, telling me what has happened to the intellectual development of her child as a result of lead in the water in that city, of many thousands of homes in California and other communities unable to drink the polluted water that comes out of their faucets. In America. In the year 2016. In a nation whose infrastructure is crumbling before our eyes. It is about ending the disgrace that too many veterans still sleep out on the streets, that homelessness is increasing and that tens of millions of Americans, because of a lack of affordable housing, are paying 40, 50 percent or more of their limited incomes to put a roof over their heads. It is about ending the disgrace that, in a given year, corporations making billions in profit avoid paying a nickel in taxes because they stash their money in the Cayman Islands and other tax havens. This campaign is about defeating Donald Trump, the Republican candidate for president. After centuries of racism, sexism and discrimination of all forms in our country we do not need a major party candidate who makes bigotry the cornerstone of his campaign. We cannot have a president who insults Mexicans and Latinos, Muslims, women and African-Americans. We cannot have a president who, in the midst of so much income and wealth inequality, wants to give hundreds of billions of dollars in tax breaks to the very rich. We cannot have a president who, despite all of the scientific evidence, believes that climate change is a hoax. The major political task that we face in the next five months is to make certain that Donald Trump is defeated and defeated badly. And I personally intend to begin my role in that process in a very short period of time. Here is a cold, hard fact that must be addressed. Since 2009, some 900 legislative seats have been lost to Republicans in state after state throughout this country. In fact, the Republican Party now controls 31 state legislatures and controls both the governors’ mansions and statehouses in 23 states. That is unacceptable. We need to start engaging at the local and state level in an unprecedented way. Hundreds of thousands of volunteers helped us make political history during the last year. These are people deeply concerned about the future of our country and their own communities. Now we need many of them to start running for school boards, city councils, county commissions, state legislatures and governorships. State and local governments make enormously important decisions and we cannot allow right-wing Republicans to increasingly control them. I hope very much that many of you listening tonight are prepared to engage at that level. Pease go to my website at berniesanders.com/win to learn more about how you can effectively run for office or get involved in politics at the local or state level. I have no doubt that with the energy and enthusiasm our campaign has shown that we can win significant numbers of local and state elections if people are prepared to become involved. I also hope people will give serious thought to running for statewide offices and the U.S. Congress. Let me conclude by once again thanking everyone who has helped in this campaign in one way or another. We have begun the long and arduous process of transforming America, a fight that will continue tomorrow, next week, next year and into the future. My hope is that when future historians look back and describe how our country moved forward into reversing the drift toward oligarchy, and created a government which represents all the people and not just the few, they will note that, to a significant degree, that effort began with the political revolution of 2016. Reception to the speech has varied. Many have had favorable comments. Some are upset that Bernie didn’t outright say he conceded. That hardly matters when he acknowledged that Hillary Clinton would be the nominee and he would work with her to defeat Donald Trump. Assuming a general election campaign between Clinton and Trump excludes unlikely events–but in an unusual year such as this we can still hope, considering how terrible a choice this is. 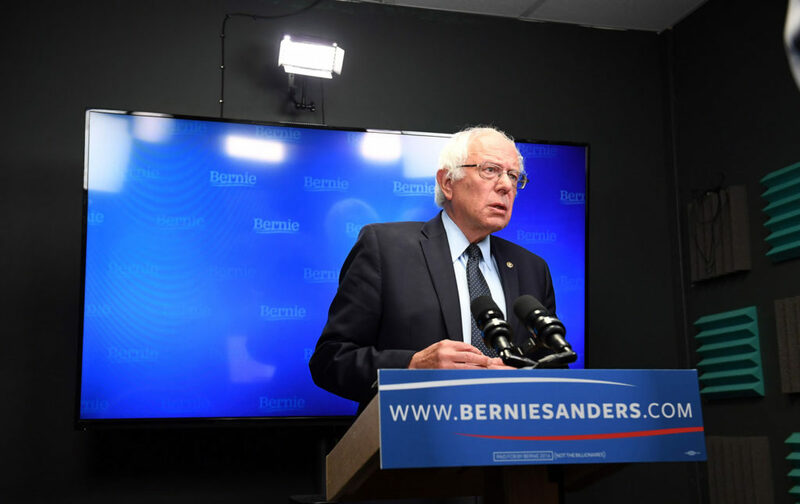 Commentators such as Rick Klein and Gabriel Debenedetti miss the point when they discuss how this impacts Sanders’ leverage at the Democratic convention. Leverage at the convention is a relatively minor matter. While there might be some satisfaction in having his goals included in the platform, this will have little bearing on what Hillary Clinton will do if elected. No matter what is said at the convention, the Democratic Party under Hillary Clinton will be a conservative party which seeks to move the country to the right, as Clinton has done throughout her career. There are no planks which can be put in the platform which will keep Clinton from unnecessarily going to war, expanding the surveillance state, or increasing the move towards oligarchy. This will have to be done by continued pressure on Clinton and the Democratic Party–not by endorsing Clinton and blindly going along. The bad news is that no amount of leverage at the Democratic convention changes the fact that Clinton’s victory is a victory for the DLC Democrats. The good news is that Sanders’ viewpoint is preferred by a large margin by voters under the age forty-five (with many of us older voters also objecting to having what amounts to having two Republican parties). This is where Sanders’ leverage is–not at the 2016 convention but with voters in future elections. That is why Sanders’ maximizes his leverage by keeping his supporters engaged, not by endorsing Hillary Clinton and keeping quiet after that.